Keith Ellison, Where Are You? 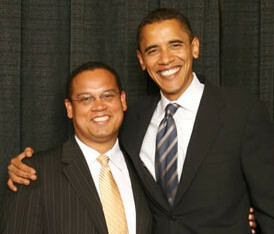 Keith Ellison (left) with Barack Obama. MICHAEL LERNER: You are aware that the Jerusalem Post printed an article by Daniel Pipes identifying you and Tariq Ramadan as intellectual challengers to American values who are even more significant than the physical attack from terrorists. And I wonder if you have any response to that, or what you thought of that? KEITH ELLISON: I think that it is a paranoid and conspiratorial point of view and that it is absolutely devoid of any factual support. And that it should not be considered a serious observation. Here is the thing: I believe in democracy. I believe conflict in society should be resolved through election. I believe in the rights of women and minorities. I believe in equality in front of the law for all people. These are not the views of an extremist. I believe in religious tolerance. I support interfaith dialogue everywhere. I support Israel. I support the Palestinian people and I support their aspiration for a state. I support Israel's aspiration to live in peace and security but side-by-side with that state. So Daniel Pipes's point of view is simply not accurate. I make no personal ad hominem attacks against Mr. Pipes — I don't know Mr. Pipes — and I am sure he has reasons for thinking what he thinks; I am not suggesting they are legitimate reasons, I am sure they are not. But I am sure he has justification for his thoughts. I wouldn't mind talking to the man one day because anybody so seriously incorrect really needs some time and attention with people who can help him develop a greater level of understanding. That is all I have to say about that. Keith Ellison with Islamic Society of North America interns. I read with interest the interview you gave Tikkun, where you said about me: "Daniel Pipes's point of view is simply not accurate. . . . I wouldn't mind talking to the man one day because anybody so seriously incorrect really needs some time and attention with people who can help him develop a greater level of understanding." I appreciate that you "wouldn't mind talking" to me and in like spirit, I invite you to a public debate on a topic such as "Islam and the United States." After getting no response, I sent the letter again on January 29, this time also to the district office. Still no reply. An effort via Facebook likewise failed. (1) Maybe Mr. Ellison made himself scarce because someone tipped him off to my debate with Ken Livingstone? (2) I again invite Mr. Ellison to a debate. (3) That debate should be clarifying and useful both for ourselves and for our audience. You take a guy like Daniel Pipes. He said I was worse than Osama Bin Laden. He wrote in the Jerusalem Post that people like me, Tariq Ramadan and others were Islamism 2.0 and that Osama Bin Laden was Islamism 1.0 and that we are worse. Anyone who says things like this deserves some real scrutiny. These guys run around putting this hate out. You ask, What's going on? It's that we have this anti-Islamic industry. Comments: (1) I wonder what Ellison means by "real scrutiny"? I hope he is not suggesting that some government agency harass me because I expressed an opinion. (2) I fail to see how my seeing lawful Islamism as more dangerous than violent Islamism makes me part of an "anti-Islamic industry." If I said the violent were more dangerous than the lawful would that make me part of a "pro-Islamic industry"? Of course there will always be people like Daniel Pipes, whose article "Islamism 2.0" described me, and other Muslims who believe in liberal democracy, as a "greater threat to western civilization" than Osama Bin Laden. 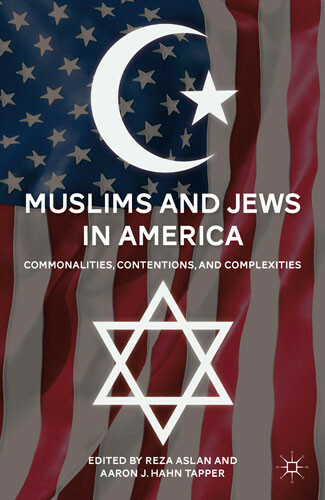 Every community has its fringe, including the Muslim commu­nity, wherein characters such as Anwar Awlaki, the Yemeni American cleric and propogandist for al-Qaeda, have openly called for American Muslims to attack their own country. (1) Can't Ellison afford a spell check program? (2) So, I am the counterpart of Anwar al-Awlaki? It would be instructive were Ellison to explain his thinking here in a bit more detail. (3) This brings to mind the time in 2004 when the Muslim Public Affairs Council compared me to Osama bin Laden.